That was Shep Messing, during the MSG broadcast of this one, referring to the one and only Thierry. I would go a bit further than Mr. Messing by saying TH14 is the best player who has EVER played in Major League Soccer. Surely this three assist (which no MetroBulls player has accomplished since 2002), one golazo, Player of The Week performance was his best ever in a Red Bulls kit (mates). After the Red Bulls gave up the customary early goal to the opposition, it was time for Henry to, once again, take the team on his back and will it to victory. A pinpoint corner to Markus Holgersson and we were level. A nifty give-and-go with the brilliant Lloyd Sam (making his first start), finishing with a deft touch to Kenny Cooper, who would not dare to miss an open netter, and we took the lead for good. That's how the first half ended, but the best was yet to come. Those were Shep's words after the third RBNY goal, where TH14 displayed some beautiful footwork in the box, before laying it off, once again, to a wide open Kenny Cooper. The celebration was fitting in that every Red Bulls player, on the sidelines and on the pitch, mobbed Henry, as the brilliance of the goal was all TH14's. But still, the best was yet to come. Truer words were never spoken. In added time (93rd minute) Brandon Barklage kept a ball from going out of bounds, on the right, and his kick found Kenny Cooper in the middle of the pitch. With Toronto's backline stretched thin, "Super" Cooper put a fabulous through ball into space, right into the path of a streaking Henry. What followed was a one touch, goal-of-the-week candidate, from King Thierry, that is best seen than described. A fantastic performance by TH14, who showed (once again) that he's the class of MLS. More importantly, it was a much needed three points that keeps us in contention for the top spots in the East. That said, this victory was against the worst team in the League, and we're still givin up ridiculous early goals. We have two home games coming up, against Chicago (on Saturday) and against Sporting KC (on October 20th). Make no mistake - those massive fixtures will be Statement Games. The one against Sporting KC, undoubtedly the best team in the East, will be huge. If we can't get positive results from those two, I'm not confident we can go far in the playoffs. Two losses and the season finale @Philth-adelphia will be do-or-die. Please see the video up top for pre-game and half-time comments. Please click here for post-game comments. Please click here for my photo album (slide show here). You can also click here for a great photo album from Matt Kremkau (slide show here). 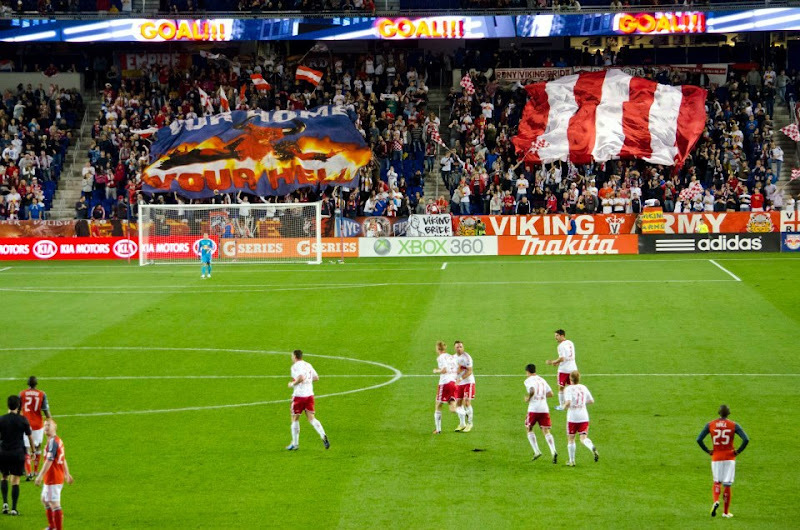 I hope to see you all Saturday @The Cathedral of Football, Red Bull Arena (built by Makita). Viper Out!